Put the politicians on minimun wage and watch how fast things change. Each piece in Stephen Seemayer’s new show of artworks at District Gallery in Downtown L.A. is built on a reconstructed front page of the Los Angeles Times from each day of Occupy L.A.
During October and November 2011, Seemayer and his wife, filmmaker Pamela Wilson, spent time nearly every day talking with and documenting the occupiers who were camped out in tents and makeshift shelters around L.A.’s City Hall. Banks got bailed out, we got sold out. Our democracy is corrupted by greed. 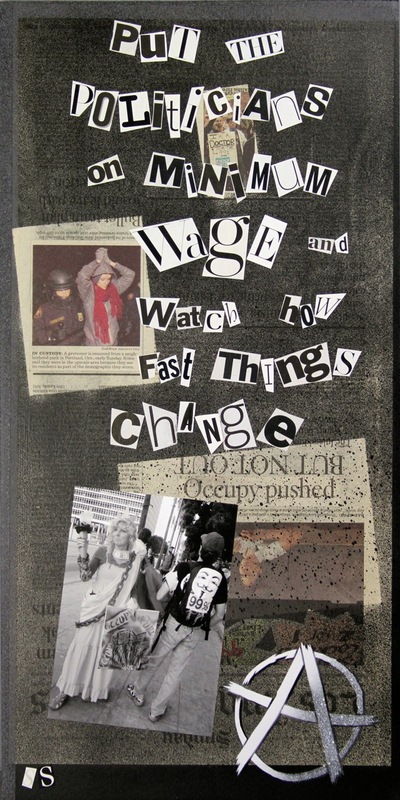 Seemayer’s energetic collages incorporate the slogans and signage that got the occupiers’ messages across, along with photographs and graphic stencils of revolutionary symbolism. Signs of the Times continues through May 26. This entry was posted in Current and tagged aerosol, art, arts district, district gallery, downtown l.a., graffiti, los angeles, occupy, occupy l.a., occupy wall street, paint, paintings, seemayer, show, spray paint, stephen, stephen seemayer, young turks by stephenseemayer. Bookmark the permalink.